Boost Mobile is running some new promotions. One promotion builds on the LG G6 for $49.99 deal that was released a couple of weeks ago. 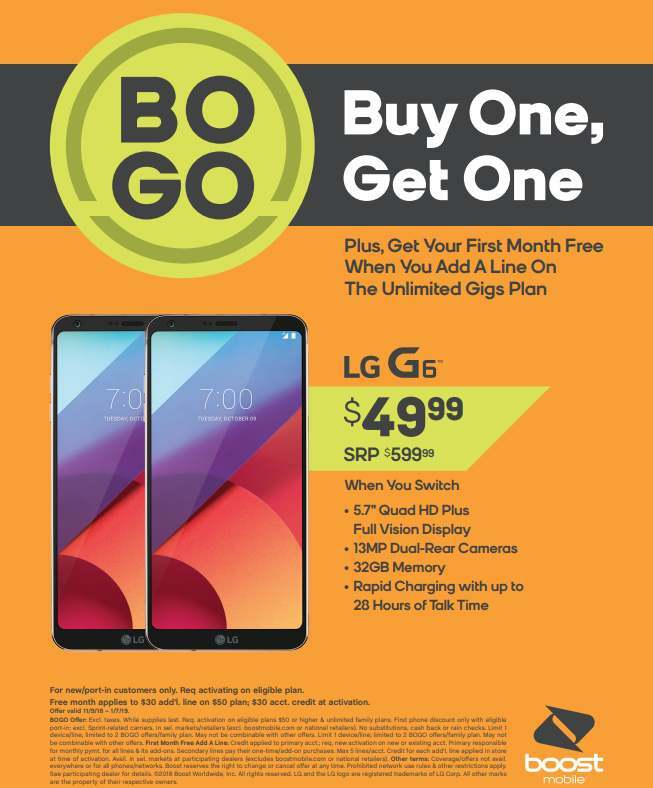 Boost Mobile is now marketing this deal as a buy one get one offer. Subscribers can also get a free month of service when the second line gets activated on the $50 Unlimited Gigs plan. Another new offer available is that customers can now get a Samsung Galaxy J7 Refine for free with port in. Boost Mobile is also celebrating Veteran's Day by offering 20% off all Android phone purchases through 11/15/18 with the use of the coupon code VETS2018. This may be a dealer only offer. It's not advertised on the Boost Mobile website and the promotional material states that it is not available at boostmobile.com or at national retailers. It is only available in select markets and through select retailers. To get the BOGO deal, new customers must activate on eligible plans priced $50 or higher. Boost Mobile's $50 plan, called Unlimited Gigs, includes unlimited talk, text and data with 12GB of mobile hotspot. Taxes and fees are included in the price. There is a limit of 1 device allowed per line, so you'll need to be activating a minimum of two lines on a family plan to take advantage of the offer. When you do activate the second line, the second line will get a free month of service in the form of a $30 account credit. Boost Mobile charges $30/month for additional Unlimited Gigs lines added to the primary line on that same plan. This offer is not available to those porting in from Sprint related carriers. There is a maximum of 2 BOGO offers allowed per family plan. So customers can get a maximum of 4 phones for $49.99 each. Boost Mobile has been selling the LG G6 for $269.99 or $215.99 through its website with the code VETS2018 applied. The BOGO deal will be available until 1/7/19 or while supplies last. The Samsung Galaxy J7 Refine offer comes with most of the same limitations that the LG G6 BOGO offer has. It is for new customers only and those coming from a Sprint related carrier are not eligible to get it. Customers are also required to activate on a plan priced $50 or higher and it is not available at boostmobile.com or through national retailers. It will only be available for free until 1/7/19 or while supplies last. The Samsung Galaxy J7 Refine normally retails on the Boost Mobile website for $229.99. However, it is now on sale for $149.99 or $119.99 with the code VET2018 applied. If you are interested in picking one of these phone offers and think you may soon want to use the phone on another network, you need to be aware of Boost Mobile's unlocking policy. Subscribers must keep their phone active on the network for a minimum of 12 months before it can be unlocked.